Moz’s Domain Authority is requested over 1,000,000,000 times per year, it’s referenced millions of times on the web, and it has become a veritable household name among search engine optimizers for a variety of use cases, from determining the success of a link building campaign to qualifying domains for purchase. With the launch of Moz’s entirely new, improved, and much larger link index, we recognized the opportunity to revisit Domain Authority with the same rigor as we did keyword volume years ago (which ushered in the era of clickstream-modeled keyword data). What follows is a rigorous treatment of the new Domain Authority metric. What I will not do in this piece is rehash the debate over whether Domain Authority matters or what its proper use cases are. I have and will address those at length in a later post. Rather, I intend to spend the following paragraphs addressing the new Domain Authority metric from multiple directions. The most important component of Domain Authority is how well it correlates with search results. But first, let’s get the correlation-versus-causation objection out of the way: Domain Authority does not cause search rankings. It is not a ranking factor. Domain Authority predicts the likelihood that one domain will outrank another. That being said, its usefulness as a metric is tied in large part to this value. The stronger the correlation, the more valuable Domain Authority is for predicting rankings. The true first page is what most users experience, thus the predictive power of Domain Authority will be focused on what users see. By not using any special parameters, we’re likely to get Google’s typical results. We did NOT use the same training set or training set size as we did for this correlation study. That is to say, we trained on the top 10 but are reporting correlations on the true first page. This prevents us from the potential of having a result overly biased towards our model. I randomly selected 16,000 keywords from the United States keyword corpus for Keyword Explorer. I then collected the true first page for all of these keywords (completely different from those used in the training set.) I extracted the URLs but I also chose to remove duplicate domains (ie: if the same domain occurred, one after another.) For a length of time, Google used to cluster domains together in the SERPs under certain circumstances. It was easy to spot these clusters, as the second and later listings were indented. No such indentations are present any longer, but we can’t be certain that Google never groups domains. If they do group domains, it would throw off the correlation because it’s the grouping and not the traditional link-based algorithm doing the work. I collected the Domain Authority (Moz), Citation Flow and Trust Flow (Majestic), and Domain Rank (Ahrefs) for each domain and calculated the mean Spearman correlation coefficient for each SERP. I then averaged the coefficients for each metric. Moz’s new Domain Authority has the strongest correlations with SERPs of the competing strength-of-domain link-based metrics in the industry. The sign (-/+) has been inverted in the graph for readability, although the actual coefficients are negative (and should be). Moz’s Domain Authority scored a ~.12, or roughly 6% stronger than the next best competitor (Domain Rank by Ahrefs.) Domain Authority performed 35% better than CitationFlow and 18% better than TrustFlow. This isn’t surprising, in that Domain Authority is trained to predict rankings while our competitor’s strength-of-domain metrics are not. It shouldn’t be taken as a negative that our competitors strength-of-domain metrics don’t correlate as strongly as Moz’s Domain Authority — rather, it’s simply exemplary of the intrinsic differences between the metrics. That being said, if you want a metric that best predicts rankings at the domain level, Domain Authority is that metric. Historically, Domain Authority has focused on only one single feature: maximizing the predictive capacity of the metric. All we wanted were the highest correlations. However, Domain Authority has become, for better or worse, synonymous with “domain value” in many sectors, such as among link buyers and domainers. Subsequently, as bizarre as it may sound, Domain Authority has itself been targeted for spam in order to bolster the score and sell at a higher price. While these crude link manipulation techniques didn’t work so well in Google, they were sufficient to increase Domain Authority. We decided to rein that in. The first thing we did was compile a series off data sets that corresponded with industries we wished to impact, knowing that Domain Authority was regularly manipulated in these circles. While it would be my preference to release all the data sets, I’ve chosen not to in order to not “out” any website in particular. Instead, I opted to provide these data sets to a number of search engine marketers for validation. The only data set not offered for outside validation was Moz customers, for obvious reasons. For each of the above data sets, I collected both the old and new Domain Authority scores. This was conducted all on February 28th in order to have parity for all tests. I then calculated the relative difference between the old DA and new DA within each group. Finally, I compared the various data set results against one another to confirm that the model addresses the various methods of inflating Domain Authority. In the above graph, blue represents the Old Average Domain Authority for that data set and orange represents the New Average Domain Authority for that same data set. One immediately noticeable feature is that every category drops. Even random domains drops. This is a re-centering of the Domain Authority score and should cause no alarm to webmasters. There is, on average, a 6% reduction in Domain Authority for randomly selected domains from the web. Thus, if your Domain Authority drops a few points, you are well within the range of normal. Now, let’s look at the various data sets individually. Using the same methodology of finding random domains which we use for collecting comparative link statistics, I selected 1,000 domains, we were able to determine that there is, on average, a 6.1% drop in Domain Authority. It’s important that webmasters recognize this, as the shift is likely to affect most sites and is nothing to worry about. Of immediate interest to Moz is how our own customers perform in relation to the random set of domains. On average, the Domain Authority of Moz customers lowered by 7.4%. This is very close to the random set of URLs and indicates that most Moz customers are likely not using techniques to manipulate DA to any large degree. Surprisingly, link buyers only lost 15.9% of their Domain Authority. In retrospect, this seems reasonable. First, we looked specifically at link buyers from blog networks, which aren’t as spammy as many other techniques. Second, most of the sites paying for links are also optimizing their site’s content, which means the sites do rank, sometimes quite well, in Google. Because Domain Authority trains against actual rankings, it’s reasonable to expect that the link buyers data set would not be impacted as highly as other techniques because the neural network learns that some link buying patterns actually work. Here’s where the fun starts. The neural network behind Domain Authority was able to drop comment spammers’ average DA by 34%. I was particularly pleased with this one because of all the types of link manipulation addressed by Domain Authority, comment spam is, in my honest opinion, no better than vandalism. Hopefully this will have a positive impact on decreasing comment spam — every little bit counts. I was actually quite surprised, at first, that link sellers on average dropped 56% in Domain Authority. I knew that link sellers often participated in link schemes (normally interlinking their own blog networks to build up DA) so that they can charge higher prices. However, it didn’t occur to me that link sellers would be easier to pick out because they explicitly do not optimize their own sites beyond links. Subsequently, link sellers tend to have inflated, bogus link profiles and flimsy content, which means they tend to not rank in Google. If they don’t rank, then the neural network behind Domain Authority is likely to pick up on the trend. It will be interesting to see how the market responds to such a dramatic change in Domain Authority. One of the features that I’m most proud of in regards to Domain Authority is that it effectively addressed link manipulation in order of our intuition regarding quality. I created three different data sets out of one larger data set (auction domains), where I used certain qualifiers like price, TLD, and archive.org status to label each domain as high-quality, mid-quality, and low-quality. In theory, if the neural network does its job correctly, we should see the high-quality domains impacted the least and the low-quality domains impacted the most. This is the exact pattern which was rendered by the new model. High-quality auction domains dropped an average of 61% in Domain Authority. That seems really high for “high-quality” auction domains, but even a cursory glance at the backlink profiles of domains that are up for sale in the $10K+ range shows clear link manipulation. The domainer industry, especially the domainer-for-SEO industry, is rife with spam. There is one network on the web that troubles me more than any other. I won’t name it, but it’s particularly pernicious because the sites in this network all link to the top 1,000,000 sites on the web. If your site is in the top 1,000,000 on the web, you’ll likely see hundreds of root linking domains from this network no matter which link index you look at (Moz, Majestic, or Ahrefs). You can imagine my delight to see that it drops roughly 79% in Domain Authority, and rightfully so, as the vast majority of these sites have been banned by Google. Continuing with the pattern regarding the quality of auction domains, you can see that “mid-quality” auction domains dropped nearly 95% in Domain Authority. This is huge. Bear in mind that these drastic drops are not combined with losses in correlation with SERPs; rather, the neural network is learning to distinguish between backlink profiles far more effectively, separating the wheat from the chaff. If you spend any time looking at dropped domains, you have probably come upon a domainer network where there are a series of sites enumerated and all linking to one another. For example, the first site might be sbt001.com, then sbt002.com, and so on and so forth for thousands of domains. While it’s obvious for humans to look at this and see a pattern, Domain Authority needed to learn that these techniques do not correlate with rankings. The new Domain Authority does just that, dropping the domainer networks we analyzed on average by 97%. Finally, the worst offenders — low-quality auction domains — dropped 98% on average. Domain Authority just can’t be fooled in the way it has in the past. You have to acquire good links in the right proportions (in accordance with a natural model and sites that already rank) if you wish to have a strong Domain Authority score. For most webmasters, this means very little. Your Domain Authority might drop a little bit, but so will your competitors’. For search engine optimizers, especially consultants and agencies, it means quite a bit. The inventories of known link sellers will probably diminish dramatically overnight. High DA links will become far more rare. The same is true of those trying to construct private blog networks (PBNs). Of course, Domain Authority doesn’t cause rankings so it won’t impact your current rank, but it should give consultants and agencies a much smarter metric for assessing quality. What are the best use cases for DA? Compare changes in your Domain Authority with your competitors. If you drop significantly more, or increase significantly more, it could indicate that there are important differences in your link profile. Compare changes in your Domain Authority over time. The new Domain Authority will update historically as well, so you can track your DA. If your DA is decreasing over time, especially relative to your competitors, you probably need to get started on outreach. Assess link quality when looking to acquire dropped or auction domains. Those looking to acquire dropped or auction domains now have a much more powerful tool in their hands for assessing quality. Of course, DA should not be the primary metric for assessing the quality of a link or a domain, but it certainly should be in every webmaster’s toolkit. What should we expect going forward? We aren’t going to rest. An important philosophical shift has taken place at Moz with regards to Domain Authority. In the past, we believed it was best to keep Domain Authority static, rarely updating the model, in order to give users an apples-to-apples comparison. Over time, though, this meant that Domain Authority would become less relevant. Given the rapidity with which Google updates its results and algorithms, the new Domain Authority will be far more agile as we give it new features, retrain it more frequently, and respond to algorithmic changes from Google. We hope you like it. Not everyone has time to watch C-SPAN for five-and-a-half hours in the middle of the week. Not even to watch President Trump’s former lawyer and fixer Michael Cohen call Trump a “racist,” “con man” and “cheat,“ as happened on Wednesday. And not even to watch Cohen be forcefully questioned by Republicans in response. As such, we rely on the news media to watch for us. But the media is not a monolith. How an outlet condenses a big event like the Cohen hearings can shade how its audience interprets the events. And when it came to cable news, the networks differed in their coverage of the hearing’s aftermath, as you might expect. But an analysis of how the words used by each network differed is a window into how they’re framing the threats to Trump’s presidency. MSNBC, for example, appeared particularly focused on the legal implications of the hearing — on Robert Mueller and prosecutors. CNN was heavy on issues of credibility, money and payments, and the claim by Cohen that Trump is a “racist.” And Fox News was especially focused on other news altogether, namely what was happening thousands of miles away, where Trump was sitting down with Kim Jong Un. Certain specific words gave the Cohen hearing these flavors on each of the three cable networks. Using data from the Internet Archive’s Television News Archive and processed by the GDELT Project, we analyzed the coverage of Cohen on CNN, Fox News and MSNBC from 5 p.m. to midnight the day of the testimony.1 To suss out any differences in the networks’ coverage, we first looked at when “Cohen” was spoken and which other words were said within the same 15-second window. (That’s the size of the clips we can access from the data sources.) 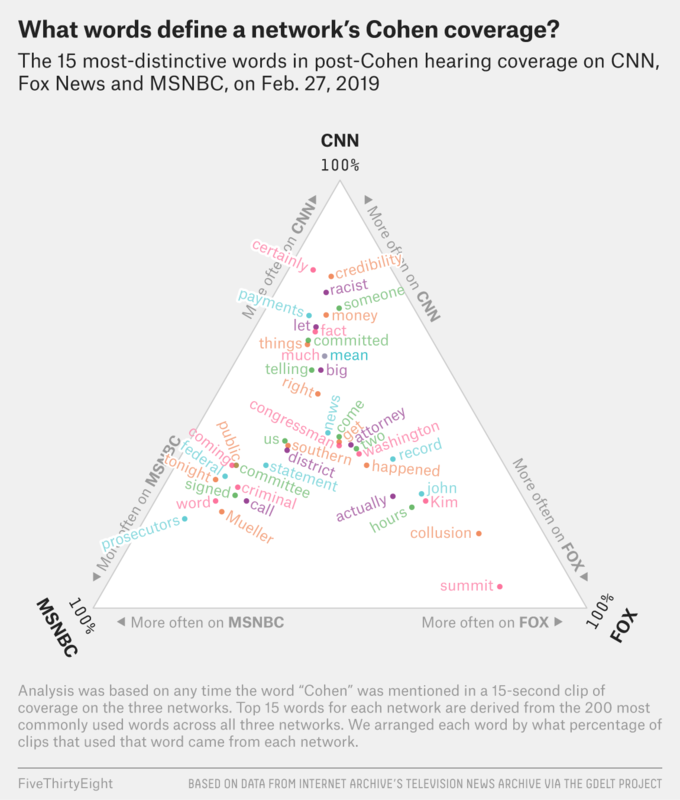 Then we looked at the 200 most-used Cohen-adjacent words across the three networks and isolated the 15 words that were most particular to each network. (By most particular, we mean the words that were used relatively more often in a network’s Cohen coverage. )2 You’ll see those words plotted on the chart below; we arranged each word by what percentage of clips that used that word came from each network. For example, of all the Cohen-related clips mentioning the word “summit,” 80 percent were on Fox News, 15 percent were on MSNBC and 5 percent were on CNN. And the qualitative flavor of the coverage varied widely as well. CNN talking head Chris Cillizza baldly declared “winners” and “losers” from the hearing. The former included the performance during the hearing of U.S. Rep. Alexandria Ocasio-Cortez of New York — “and man, did she nail it.” Ocasio-Cortez’s interrogation of Cohen was praised elsewhere for being “well thought out.” The latter included Mark Meadows, the chairman of the House Freedom Caucus, who was “out for blood,” revealing little in his questions beyond his contempt for Cohen. Fox & Friends then stepped hard on the FiveThirtyEight brand, comparing data on the amount of time the cable news networks had spent on Cohen versus the U.S.-North Korea summit during the run-up to the hearing, lamenting the fact that the other networks had given far more airtime to the former. “There’s a reason they call us fair and balanced,” a host said. (FiveThirtyEight has not independently verified those numbers.) The summit fell apart early, and no deal was reached. There will be more political events in the weeks and months to come. The cable networks’ coverage surely won’t march in lockstep on those, either. We’ll be watching. Hands down The Best Site To Buy Your Domain Name is NameSilo.com. They deal with all manner of TLDs (the last few letters after the last . in a name i.e. .com) and they are consistently cheap to register, they come with FREE Privacy Protection (Which Godaddy Charges Like $8 For) AND heres the kicker … when you need to renew the next year …. Now that might not be a big deal if you have one .com address and you just like paying 3 times the price for stuff. But we are currently operating about 200 domains and NameSilo.com will save Ultimate SEO about $3598! There isn’t any other trade off I can think of … Godaddy provides lots of add on stupid services like email ( comes with your hosting usually ) … Website Builders … look like website builders sites look. Hosting but I prefer AWS which is what they are anyway. Scroll to the bottom and you’ll find the complete listing of NameSilo’s renewal costs for domains. Network Solutions is the absolute worst registrar I’ve used in twenty years of buying domain names. My experience runs from 2018 to 2019 with only one domain name, I was skeptical of them and bought just the one address as a test and they failed in every opportunity and then some. I say and then some because 3 or 4 months before my name had to be renewed they couldnt bill the card on file ( I didnt want them too ) so they emailed and I ignored it…they suspended the domain pending email verification! I had been tipped off to issues from the start when their website kept crashing or the forms kept forgetting what was going in to them…it took me multiple attempts to order the single name. I then pointed the DNS as I wanted but nothing happened for 3 days…so I created a ticket and had a run around issue when finally they gave it turned on….I lost a couple weeks there. It also then stopped working magically a week later and was down another week. They also have Auto Opt In services you need to be watchful for…like email. I had months of paid time that I didnt get from them … I was ignoring their promotional crap. So they turned me off until I verified my email again. Outrageous I immediately started the transfer process out. Here are some more people’s Network Solutions stories…..the worst place to buy a domain name. Is with your hosting company. I prefer checks and balances and your hosting company already holds all your files over your head…dont give them your name too. It may be free but for 8 bucks pay someone else so no matter what your host company says or does you can take your name and run. BTW No one paid us or gave us anything for free, this is what Ultimate SEO actually thinks. Here’s the prices from our pick for Best Site To Buy Your Domain Name. On the one hand, the Los Angeles Lakers’ loss to the Milwaukee Bucks on Friday night wasn’t the most surprising thing. After all, the Bucks — who staged a late run to earn the victory in Los Angeles — own the NBA’s best record and have a leading MVP candidate in Giannis Antetokounmpo. On the other hand, the Lakers surrendering a 15-2 run — and the lead — over the final three minutes of play may have put the team’s back against the wall in an entirely new way. But a number of realities are setting in now. The Lakers are 4 games behind the Los Angeles Clippers for the seventh seed and 3.5 games back of the San Antonio Spurs, who own the head-to-head tiebreaker (meaning their lead is more like 4 games, since the Lakers would miss out on the postseason if they were to finish with the same record as San Antonio). Perhaps the most disheartening thing, aside from having a lot of ground to make up, is the fact that the other teams vying for the last two spots have much easier remaining schedules. Our projections surmise that it will ultimately take about 44 victories to earn a spot in the Western Conference playoffs. In order to reach that win total, the Lakers would need to finish 14-6 against the NBA’s 10th-toughest remaining schedule — one that has 10 home games and 10 road ones. They still have to play the Denver Nuggets, Boston Celtics, Bucks again, Golden State Warriors and Oklahoma City Thunder, among others. James has faced late-season pressure to lift his team out of the doldrums each of the past few seasons. But this scenario with the Lakers stands apart, both because of how much time he missed with injury (one that now looks as if it will cost the team a playoff spot), and because of how the young supporting cast struggled to hold the rope during his absence, going 6-11. It’s one thing to coast into the postseason, the way James’s Miami and Cleveland clubs often did. But James himself hasn’t missed the playoffs in 14 years, not since the 2004-05 season. If there’s a bright side, it’s that the Lakers finally look engaged. They held Antetokounmpo to just 16 points, one of his lowest-scoring outputs in a dominant season. Youngster Brandon Ingram has showcased his scoring ability lately and was unstoppable Friday, finishing with 31 points. But the time to celebrate moral victories for this team has run out, unfortunately. A sixth-straight season of missing the playoffs — especially now, after adding one of the league’s all-time greats — would be disastrous. And after Friday’s loss, the Lakers are staring directly at that possibility. There’s a natural tendency in the NBA to lavish attention on teams that, with every bad loss, send social media into a tizzy because of what it might mean for the league’s landscape. For instance, if the LeBron-led Lakers don’t reach the postseason — a 80 percent probability at this point — it would seem a foregone conclusion that major changes would take place in L.A. this summer. On the other extreme, then, are the Pistons. Detroit, which has been to the NBA playoffs once in the past nine seasons, desperately craves a postseason berth. But if the Pistons don’t make it, there won’t be headlines in national news outlets criticizing them for it. And even if there were, it would be tough to make big changes within an organization that has a first-year head coach and a top-heavy roster. This is their team for now. The Pistons are clearly an imperfect club. But they can bolster their fortunes by simply continuing to play the way they have in recent weeks, winning eight of their past 11 games. Through Feb. 1, the sputtering Pistons’ offense ranked 29th out of the league’s 30 teams in both effective field goal rate and true shooting percentage. Since Feb. 2, though, the club has jumped into the top five leaguewide in both categories. Unlike earlier stretches in the season, when All-Star forward Blake Griffin was carrying the offense, the Pistons have enjoyed a far more balanced approach over the past month. The team’s share of one-on-one plays — which was the NBA’s second-highest through Feb. 11 — ranked just 12th over the past month of action, according to stat-tracking database Second Spectrum. After coming into the season showing off a jumper that wasn’t quite game-ready, two-time All-Star Andre Drummond has looked better than ever simply by getting back to the basics near the rim. He’s averaging more than 22 points and 17 boards2 over his past seven games and has found considerable success with a nifty little push shot from about 8 feet out. Beyond that, maddeningly inconsistent guard Reggie Jackson has been consistently good for a month now and is shooting a career-best 36 percent from deep. The team has to use an array of handoffs and screens, both on and off the ball, to convince defenders to move and to free up jump-shooters.4 No team scores fewer fast-break points per night than Detroit, and the Pistons are less efficient after forcing a turnover on D than any other NBA club. Heading into Wednesday night’s games, only four players5 had helped boost their teams’ winning percentages more than Smith,6 according to the Elias Sports Bureau. The Pistons have logged a 21-13 record with Smith (61.8 percent) and an 8-18 mark (30.8 percent) without him. Buying stock in the Pistons feels risky because of their shallow depth and their cold spells that feel like arctic blasts straight from Canada. This 11-game stretch hasn’t been tough, featuring just two wins over teams that would make the playoffs if the season ended today. Still, Detroit owns an 87 percent playoff probability and a favorable remaining schedule — far easier than that of Brooklyn, Charlotte or Miami.7 The Pistons’ defense has been solid all year (Drummond is among the league leaders in steals), and the club limits opponents to a league-low 33.7 percent from the 3-point line. There’s a bizarre universe in which the Pistons could reach the playoffs at below .500 and still be favored in the first round. If the Pistons land at the No. 6 seed, and the Pacers minus star Victor Oladipo hold on to the No. 3, not only would Detroit have the top player in the series, but it would also have a real chance to advance to the second round. Beggars can’t be choosers, and those might be high hopes for now. But for a capped-out franchise that hasn’t reached the second round since 2008, the mere dream itself almost feels like a noteworthy accomplishment. The word is that special counsel Robert Mueller could wrap up his investigation as early as next week. Whatever the outcome, it will be an important political moment in Donald Trump’s presidency. However it probably won’t be the end of his legal troubles. In this installment of the FiveThirtyEight Politics podcast, legal reporter Amelia Thomson-DeVeaux shares an overview of the criminal investigations involving the president, ranging from campaign finance violations to fraud. Wait … Is LeBron James Actually Going To Miss The Playoffs? LeBron James has been so good for so long that it’s easy to forget just how astounding some of his accomplishments are. For example, he currently owns one of the greatest ongoing streaks in sports: His team has made the NBA Finals in eight straight seasons, starting in 2011. That’s mind-blowing in a league where a single finals appearance can be the highlight of a player’s entire career — and he’s done it for two different franchises. Of course, everyone knew it would be hard for James to keep that streak going this season after moving from the Cleveland Cavaliers — and the relative ease of the Eastern Conference — to the Los Angeles Lakers and the scary West. The thing that has taken NBA observers by surprise is the reason why the finals streak might not happen: James’s Lakers are in real danger of not making the playoffs at all. According to our NBA projection model, Los Angeles currently has just a 26 percent probability of making the playoffs. L.A. sits a game under .500 in the West’s No. 10 slot, three games back of the eighth-seeded Clippers with 25 games left on the schedule, and it will face the league’s ninth-toughest schedule down the stretch. The Lakers’ only saving grace is that, at full strength, our model thinks they’re the West’s eighth-best team, significantly better than both the Clippers and the No. 9 Sacramento Kings. But it will be a race to the finish that James hasn’t had to worry about in a very long time. The last LeBron-led team to miss the postseason entirely was the 2004-05 Cavs, in James’s second NBA season. They went 42-40 — which has traditionally been good enough to make the playoffs in the East — but lost out on a tiebreaker with the New Jersey Nets (who beat Cleveland 3-1 in the season series). Talent-wise, that team was a far cry from even later versions of the Cavs that would be prematurely bounced out of the playoffs: Journeyman guard Jeff McInnis was second on the team in minutes behind LeBron, and low-scoring swingman Ira Newble was also a full-time starter. (The next scoring options behind James were Zydrunas Ilgauskas and Drew Gooden.) James himself had not yet fully ascended to GOAT levels of performance, either, posting what would eventually be the fifth-worst Box Plus/Minus and fourth-worst win shares per 48 minutes of his career to date. On paper, this season’s Lakers should not be drawing comparisons to Jeff McInnis and Ira Newble. Although L.A.’s supporting cast didn’t have the same immediate appeal as players in other potential free-agent destinations for James, it was assumed that the young quartet of Kyle Kuzma, Brandon Ingram, Josh Hart and Lonzo Ball would build on their promising 2018 performances — particularly by playing alongside James — and mix with the Lakers’ strange mishmash of veterans to make a functional team. But that hasn’t consistently happened during James’s debut campaign in purple and gold. †PIE% = Player Impact Estimate, a rough measure of the percentage of all positive on-court events (for both teams) the player accounted for. Across a variety of metrics, LeBron’s young sidekicks have mostly declined in performance this season, despite benefiting from an extra year of development and getting to play next to one of the greatest offensive creators in NBA history. Only Kuzma can credibly say he has shown any amount of improvement, increasing his usage rate and true shooting percentage while reducing his turnover rate. The rest — particularly Ingram, whose advanced stats have slid into an abyss — have stalled out or worse, and none has even amounted to a league-average player, according to the consensus of metrics. Making matters worse, it could be argued that those four cost Los Angeles a shot at trading for New Orleans Pelicans star Anthony Davis at the deadline (assuming that former Pelicans GM Dell Demps ever actually intended to deal Davis). If even a few of the Lakers’ youngsters had played well this season, showing the requisite star potential to be included in a trade package for Davis, it’s possible that L.A. would have been penciling a LeBron-AD duo into its lineup for a playoff push this year. Instead, it’s left waiting for Hart and Ball to return from injury and hoping the kids can play better down the stretch. And it bears mentioning that James himself has not been as statistically dominant as in his last few seasons as a Cavalier. His usage rate, true shooting percentage, assist rate, rebound rate, steal rate, block rate and defensive BPM are all down from last year. He’s shooting worse on twos, threes and free throws. And most concerning, the 34-year-old missed 18 games between Christmas and early February with a groin injury, and he’s played only 49.5 percent of the Lakers’ available minutes this season — by far the lowest mark of his career. James did tell reporters over All-Star weekend that he “feels great,” though, and that he’s ready to lead a playoff push for Los Angeles. The Lakers will need to summon all of James’s focus and talent to storm back into the playoff picture. It’s more than possible, particularly if James is indeed healthy. But our projections are still low for a LeBron team even after accounting for James’s return to the lineup — and the fact that the Clippers were sellers at the trade deadline. (That’s why we give L.A. a 26 percent chance, while simpler forecasts such as the one at Basketball-Reference.com peg its odds at about 5 percent.) And even if the Lakers do make the playoffs, they would probably end up being heavy underdogs against the Golden State Warriors in the first round. The Lakers’ long-term future should be brighter: The team will have plenty of cap space to use on free agents surrounding James and plenty of superstar options to choose from (in addition to the ongoing potential of a Davis trade). For now, though, James’s finals streak has a real chance of ending far earlier than anybody expected: April 10, the final day of the 2018-19 NBA regular season. In addition to being one of the great sports stories of the 21st century — breaking a 108-year championship drought in extra innings of World Series Game 7 — the 2016 Chicago Cubs were legitimately one of the best baseball teams of all time. With a championship core of young talent that included Kris Bryant (age 24),1 Anthony Rizzo (26), Kyle Hendricks (26), Addison Russell (22), Javier Baez (23), Kyle Schwarber (23), Willson Contreras (24) and Jason Heyward (26), Chicago seemed poised to follow up that magical run by becoming a dynasty in the coming seasons. That’s not quite how things have played out. The 2017 Cubs stumbled out of the gate and never quite clicked, eventually losing to the Dodgers in the National League Championship Series. The 2018 version squandered the five-game division lead they held over the Brewers on Sept. 1, lost the division tiebreaker in Game 163 of the regular season and then promptly lost the wild-card game against Colorado. And the Cubs’ grip on the Central figures to loosen even further this season. According to a preliminary version of our 2019 MLB Projections, we give Chicago only the third-best projected record (84 wins) in the division, with a mere 24 percent chance of winning it. Based on 100,000 simulations of the 2019 MLB season. How is it possible that the Cubs went from dynasty in the making in 2016 to a team struggling to stay atop its own division in less than three years? The answer lies in part with the team’s declining core and team president Theo Epstein’s inability to supplement it with effective reinforcements from the outside — particularly when it comes to pitching. Few teams have ever undergone an overhaul as extreme as the Cubs did in the four years leading up to their championship season. Chicago improved from 16.6 wins above replacement2 during their dreadful 61-win 2012 to 56.8 WAR in 2016, with essentially all of those gains coming via newly acquired talent (rather than improvements from existing holdovers). As part of that process, Epstein made a number of shrewd trades, drafted several key contributors and increased Chicago’s payroll by 169 percent relative to the MLB average. It all came together as a textbook example of tearing down and rebuilding a franchise. The 2016 Cubs had baseball’s third-most-valuable pitchers by WAR (including the No. 1 starting rotation) and the best defense by a country mile, on top of an offense that tied for the NL lead in adjusted on-base plus slugging percentage. The pitching side was expensive and creaky — one of the oldest ever to win a World Series, in fact — but Epstein and the Cubs seemed to be winning the battle of ideas about where to invest in order to build a ballclub with perennial championship aspirations. Since 2016, though, the formula has broken down. The team’s net WAR on arrivals and departures — in which Chicago topped baseball from 2012 to 2016 — has dropped to eighth-worst in MLB. The Cubs haven’t added very many new faces, and what few acquisitions the team has made have largely flopped, particularly on the mound. Starters Tyler Chatwood, Jose Quintana and Yu Darvish all badly underperformed their established performance levels as members of the Cubs, for instance. As a result, Chicago has mainly had to rely on its existing core to keep the team in contention. This makes some sense, to a certain extent. The natural maturation process of a championship team is to add talent in the lead-up to contention, then shift toward maintaining it once the roster finally reaches the top of the heap. But that hasn’t really happened, either. Not only have the new players underperformed, the team’s nexus of homegrown talent has, too. The Cubs’ holdovers are a net -14.8 WAR since 2016, which ranks fourth-worst in MLB. The multiyear plan to build a great core and then set it loose doesn’t work when that core regresses. Positive net WAR for departures means departing players cumulatively had negative WAR the previous year. The 2018 Cubs shared some of the strengths of the 2016 club — both had top-5 defenses by WAR — but Chicago slipped to 14th in WAR from its starting rotation and was basically average offensively according to adjusted OPS. An injury to Bryant cost him 60 games, while Rizzo’s performance declined for reasons mostly unknown. * Through plate appearances or (leverage-adjusted) innings pitched. It also bears mentioning that Epstein and the Cubs have been hamstrung in how much outside talent they can add by a massive payroll bill, which has affected the team’s depth all across the diamond. In terms of marginal payroll per WAR, Chicago went from being the second-most cost-effective playoff team of 2016 to the least cost-effective playoff team of 2018. Trade pickup Cole Hamels was one of the few pitchers who didn’t underwhelm in Chicago (he was very good upon joining the Cubs at last year’s deadline). And in the field, rookie David Bote was a pleasant surprise last season. Both will be back for 2019, along with practically all the rest of the aforementioned core.4 The Cubs were briefly rumored to be in on the Bryce Harper derby, but for now Chicago’s biggest offseason acquisition is utilityman Daniel Descalso. And the lack of upgrades is part of the problem heading into 2019. Although FanGraphs projects the Cubs to have a top-5 lineup, the site sees the pitching staff dropping outside MLB’s top 10 — and with an 88-win prediction for the Cubs, FanGraphs is one of the forecasters most bullish on Chicago’s chances. If the Brewers caught the Cubs on talent last season, the Cardinals might have passed them both by now. Meanwhile, manager Joe Maddon is in the final year of his contract, with no extension in place going forward. From team leadership to the core of the roster, many of the factors that played a key role in Chicago’s rise now look shockingly uncertain three years later. The good news for Chicago, though, is that the potential still exists for an exciting summer at Wrigley Field. Even if 2016 was an outlier, a team as talented as the 2017 and 2018 Cubs — which was, after all, good enough for an average of 93.5 wins per season — remains a contender. It might not be the kind of dynasty that either Epstein or fans on the North Side had in mind when they were celebrating their curse-breaking World Series victory. But hey, at least it’s far better than all the bad Cub teams of the 1980s and ’90s that many of us grew up watching on WGN. Does Trump’s National Emergency Set A Problematic Precedent For Conservatives? President Trump has declared a national emergency to obtain funding to build a wall along the U.S.-Mexico border, after lawmakers did not approve the $5.7 billion he’d requested. And in doing so, he has sparked a debate on whether the executive branch can — or should — use its power to unilaterally achieve a policy goal. The president does have an enormous amount of latitude to declare national emergencies, but Trump’s use of the power in this way is unusual and could have far-reaching consequences. The action raises problems of both principle and precedent for some right-leaning and libertarian legal specialists. But others argue that Trump’s action is probably legal or say they’re not especially worried about potential consequences down the line. Bernstein added that he blames former President Barack Obama for beginning this trend. First in 2012 and then again in 2014, Obama issued sweeping executive orders that protected young undocumented immigrants who were brought to the country as children. But he said Republicans shouldn’t allow this kind of executive overreach to continue, particularly for an expensive project like the wall. “It’s not just that overly broad executive power is being endorsed here — it’s being endorsed for a quintessential big-government boondoggle,” he said. Trump’s declaration of a national emergency is now headed for what will almost certainly be a lengthy court battle. The more immediate question is how Republican politicians will respond. Congress has the power to terminate a president’s emergency declaration through a joint resolution of disapproval, but the resolution would need to pass with veto-proof majorities in both chambers to be successful. Some Senate Republicans have already voiced concerns similar to Pelosi’s. Sen. Marco Rubio said that “today’s national emergency is border security” but also said that a future Democratic president “may use this exact same tactic to impose the Green New Deal,” a policy framework recently proposed by Democrats that calls for large public investments to combat climate change. But other Republicans — including Senate Majority Leader Mitch McConnell — have changed their public positions; after originally opposing a national emergency declaration, they are now lining up behind the president. In the coming days and weeks, they’ll have a tough choice: whether to back the president or rebuke him.